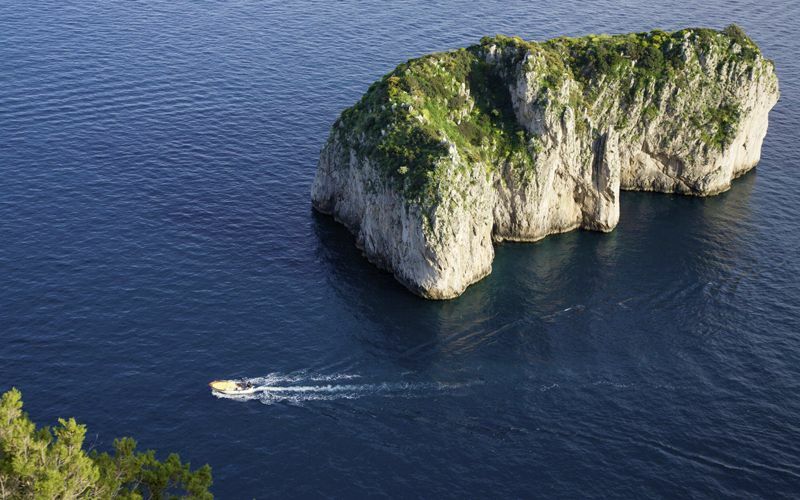 There's a place in Capri where the island's glamorous social whirl comes to a grinding halt and nature starts to reclaim center stage: at the end of the boutique-lined Via Camerelle, where Via Tragara begins. 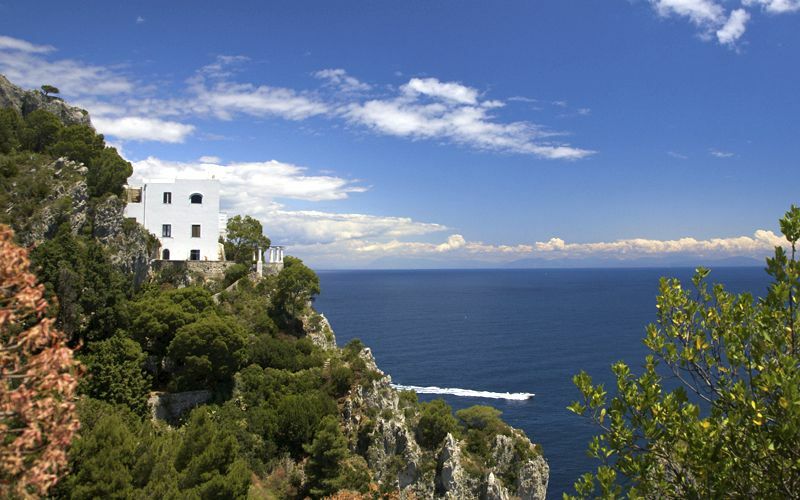 Lined with luxury hotels and villas, of which passers-by can catch only a glimpse amidst the lush vegetation which screens the properties from indiscreet eyes, Via Tragara is home to the German Evangelical Church; Villa Discopoli, residence of the writer Rainer Maria Rilke; Villa Lo Studio where the poet Pablo Neruda stayed, and Hotel Punta Tragara, said to have been designed, if only in part, by the architect Le Corbusier. 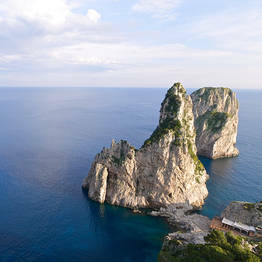 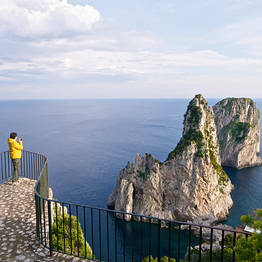 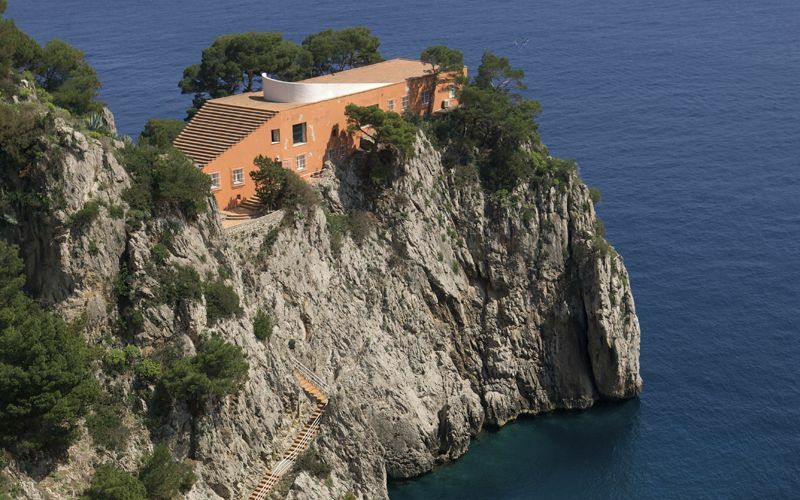 Via Tragara terminates in a large terrace with fabulous view over the Faraglioni rocks. 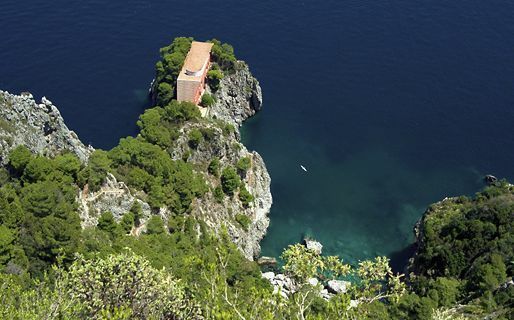 To the left one can glimpse, across the waters, a part of the Amalfi Coast whilst, to the right, there are houses clinging miraculously to the slopes, the castle-topped Monte Castiglione, Monte Solaro and the bay of Marina Piccola. 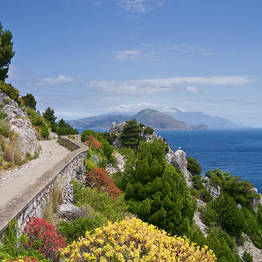 From the Tragara viewing point, a little pathway skirts round the right hand side of the terrace, to join the Pizzolungo: footpath which traces the coastline all the way to the Natural Arch. 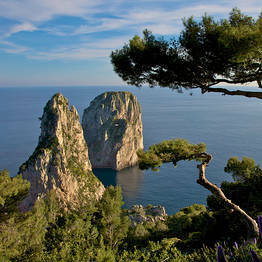 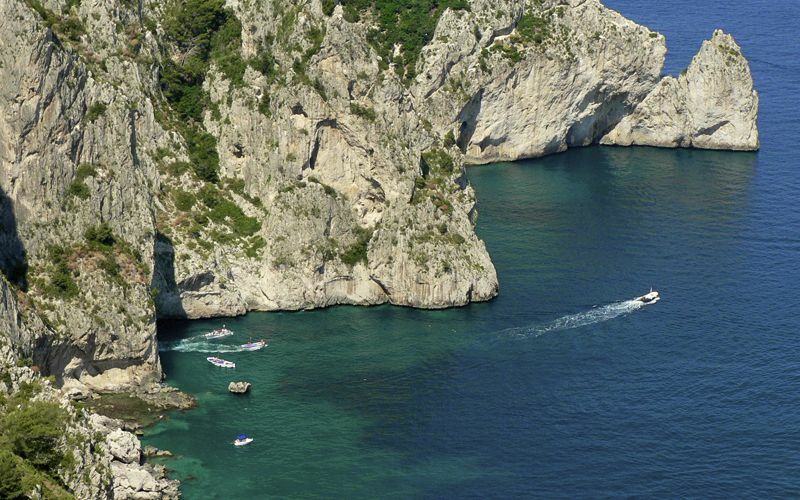 Pizzolungo is one of the most beautiful walks on the island of Capri. 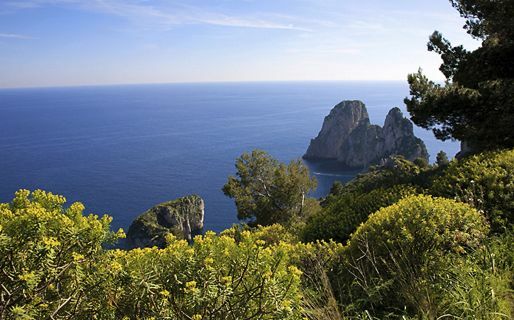 Extremely pleasant throughout the summer, the walk is especially spectacular in winter, when the strong winds and stormy seas paint the land and seascapes with colors which have bewitched any number of artists. 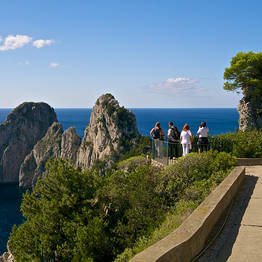 The route proceeds until meeting a narrow and extremely steep flight of steps which leads to the Grotta di Matermania. Scholars have attributed the cult rituals which were performed in the cave to the divinities Mitra or Cibele, goddess of fertility. 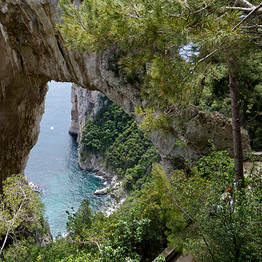 After the cave there are another 200 steps to climb before arriving at the Natural Arch. 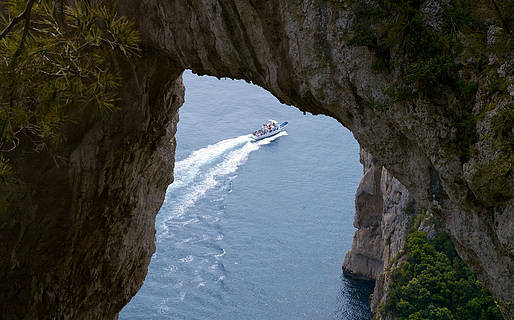 The Natural Arch, an extraordinary Paleolithic sculpture, is all that remains of a deep and incredibly high cavity of underground origin, which was discovered in the aftermath of a landslide. 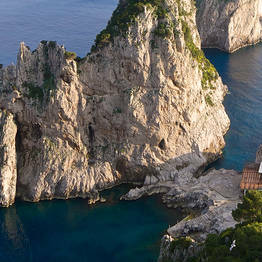 The incoherent nature of the rock has determined the continuing corrosion of the stone, leaving a 12 meter wide section of the vault suspended roughly 18 meters above the ground, which forms a natural bridge between the two pillars of rock. 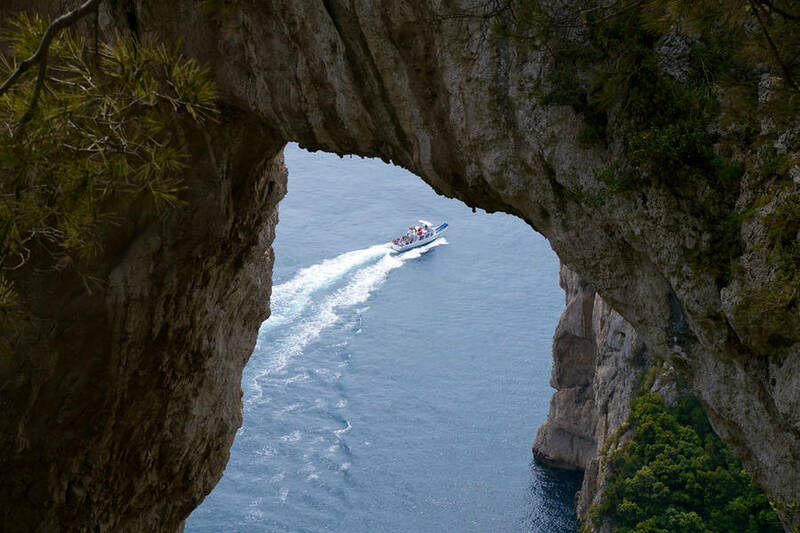 The Natural Arch is elevated high above sea level and its semicircular opening provides the perfect picture frame for the spectacular sea scenery in the distance. 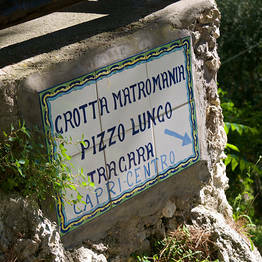 The cave is most often called the Grotta di Matermania although its is also known as the Grotta del Matrimonio or di Matrimonia. 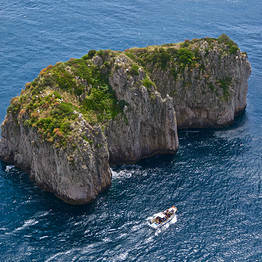 It is formed by a cavity roughly 30 meters long and 20 meters wide, with a median height of 10 meters. 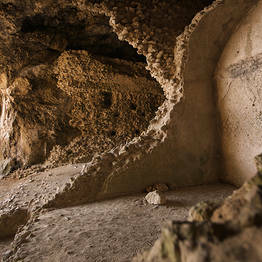 From the remains found within its interior it is not clear to which divinity the cave was dedicated in ancient times, although its use as a sacred place is certain. 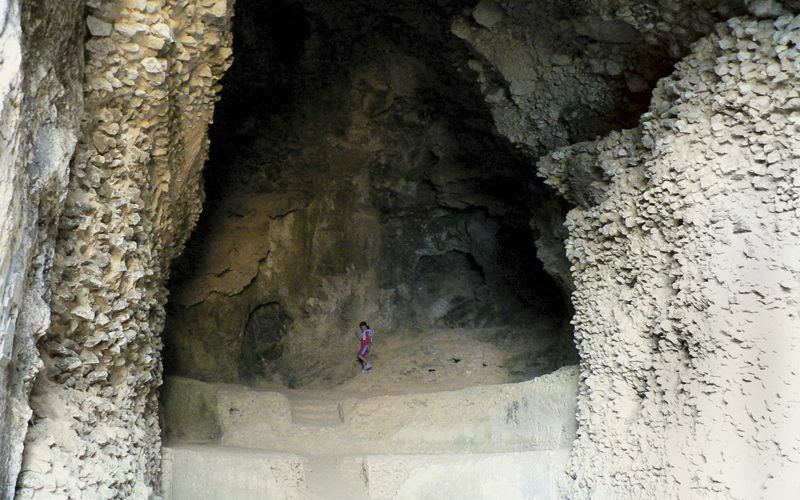 It is believed that the cult of the god Mitra might possibly have been practiced here, the associated rituals of which were almost always carried out in caves; or that of Cibele, goddess of nature, of animals and wild places. In the Roman period, the Grotta di Matermania was transformed in to a luxurious nymphaeum, where the islanders met to indulge in the "pagan" pleasures of life!